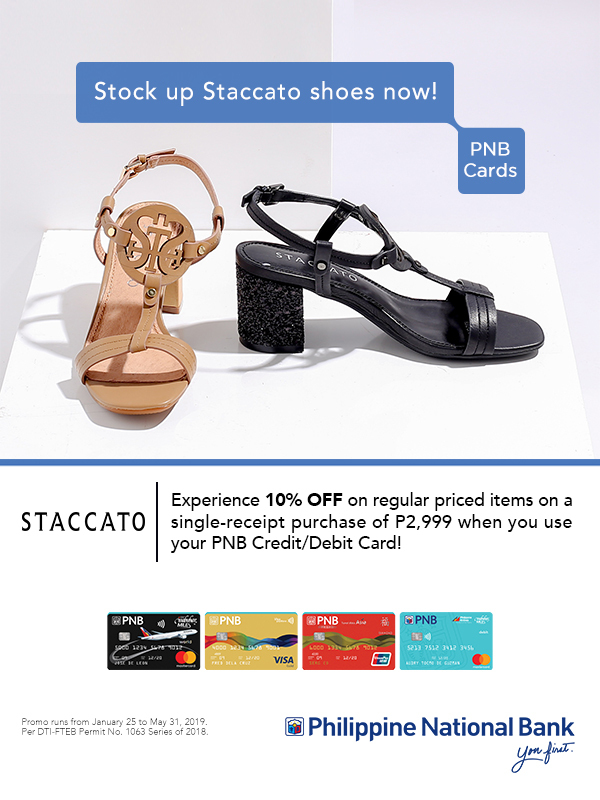 Stock up Staccato shoes now! 2. Promo runs from January 25, 2019 to May 31, 2019. 4. To avail of the promo, the Cardholder must charge the total amount of the bill to his/her PNB card in a single-receipt transaction. 5. Offers are not convertible to cash. be used in conjunction with other promotional offers by the partner merchant. 7. The Terms and Conditions governing issuance and use of PNB Credit/Debit Cards are incorporated herein by reference and made an integral part hereof. Per DTI-FTEB Permit No. 1063 Series of 2019.